A transcript of the off-the-cuff conversation between US President George W Bush and UK Prime Minister Tony Blair during a break at the G8 conference in Russia. The president was caught on tape using an expletive as he described the actions of Hezbollah in attacking Israel. They also discussed the exchange of gifts. Blair: Oh absolutely - in fact I knitted it!!! 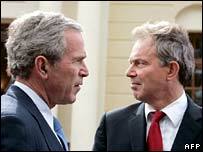 Blair: Yeah, no I think the [indistinct] is really difficult. We can't stop this unless you get this international business agreed. Bush: I think Condi [US Secretary of State Condoleezza Rice] is going to go pretty soon. Blair: But that's, that's, that's all that matters. But if you... you see it will take some time to get that together. Blair: Well... it's only if I mean... you know. If she's got a..., or if she needs the ground prepared as it were... Because obviously if she goes out she's got to succeed, if it were, whereas I can go out and just talk. Blair: He's had it. And that's what the whole thing is about. It's the same with Iran. Democracy loses out in Putin's Russia, but few seem to care if the money's right. Q&A: What is the G8? Is the G8 fit for purpose?